I saw this headline: "Creationism question 'misleading'" on the BBC News website. The AQA exam board has received a number of complaints after a question appeared on this summer's GCSE Biology paper asking students how the Bible's theory of creation seeks to explain the origins of life. I'm afraid the original wording isn't included in the news article, so we can't have a proper discussion on its significance, nor on how it might have been answered. "Merely asking a question about creationism and intelligent design does not imply support for these ideas. 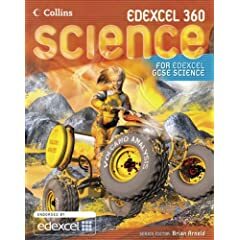 Neither idea is included in our specification and AQA does not support the teaching of these ideas as scientific." Nonetheless, the candidates were expected to have some understanding of it. A spokeswoman explained that pupils had been asked to match up several theories, including the Biblical theory of creation, with descriptions of them. She said pupils were not taught creationism as a valid scientific theory but that it would be strange not to mention it when discussing Darwinism. But this is a GCSE Biology class, and "[matching] up several theories, including the Biblical theory of creation, with descriptions of them" sounds awfully like a GCSE Religious Studies class. Discuss why Charles Darwin experienced difficulty in getting his theory of evolution through natural selection accepted by the scientific community in the 19th century. This is a world of difference to matching up theories of creation, and something I would be very happy discussing in a science class. Most people recognise nowadays that evolution explains the development of life on our planet and the extinction of the dinosaurs. However, when Charles Darwin published his book, The Origin of Species, in 1859, it created a huge controversy. Some said it contradicted the Bible's account of creation. The power of the established church was so great at the time that some scientists were frightened to support Darwin. The theory of evolution also drew on a number of different areas of study (biology, chemistry, geology, geography) and scientists did not tend to cooperate across disciplines in those days. Nowadays the vast majority of serious scientists, and many Christians, accept the theory of evolution as the best explanation we currently have. The original antagonism to the idea may have been because it was so shocking. Even today in some parts of the USA, science teachers have to be very careful to explain that evolution is just a theory (which is true for almost everything in science lessons!) to avoid criticism from fundamentalist believers. So, blogosphere, what do you think of that? Is that okay for an explanation for a 16-year-old? How could I improve that in my lessons? Given that Christianity is unlikely to be the majority religion of my students, what else might I need to consider?